We are also happy to provide special designs to meet customer requirements. Single-walled casings for the double head drilling system have a standard wall thickness of 10-16 mm and a welded-on casing shoe with cutting teeth. 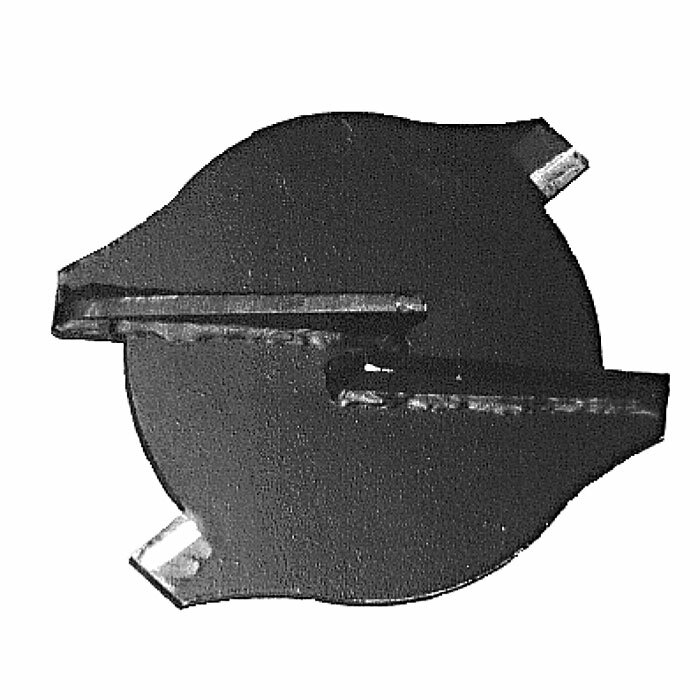 They are fitted with a male coupling for connection to the casing head adaptor, and are available in all working lengths. 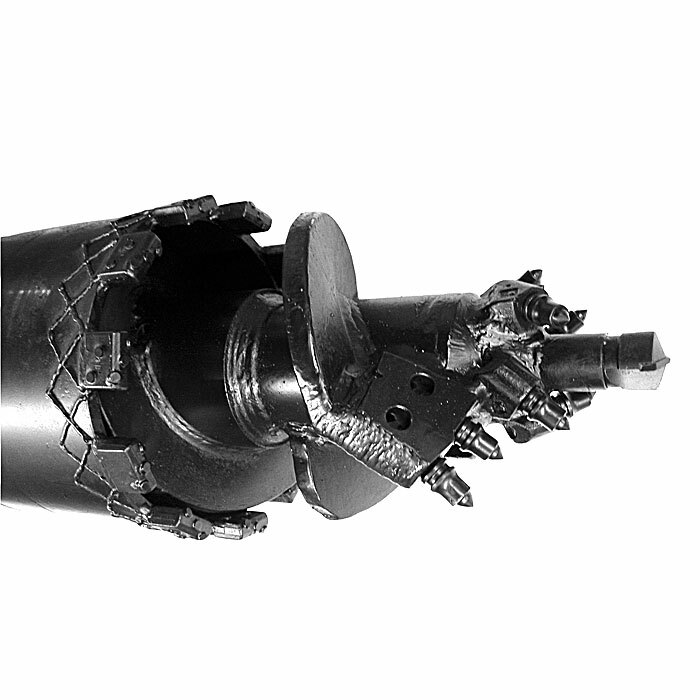 Our casings for double head drilling systems are available to suite all popular drilling units. Depending on the diameter, they have either 2 or 3 side openings for discharge of spoil, and a female coupling to accept the casing. The standard working length is 1,000 mm. The hollow stem CFA augers in our double head drilling systems, with hexagonal SW120 mm and SW150 mm connectors, are designed both for cased and uncased drilling. The internal tube diameter of 100mm The flight edge is hard=faced against wear over the entire working length and width. The two drill heads can be locked to allow the full torque of the machine to be utilised on the augers. 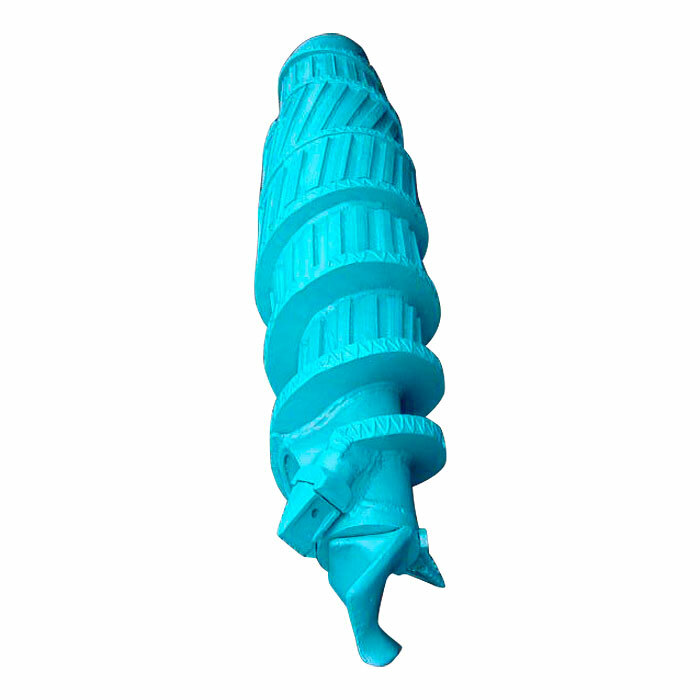 Starter augers for our double head drilling systems are available as single or double start. The cutting edge can be provided flat-teeth or bullet teeth, or a combination of the two, depending on the nature of the soil. To prevent penetration of spoil into the hollow stem, the concrete prot slots is located behind the lead flight and provided with a recess to take a lost bung. 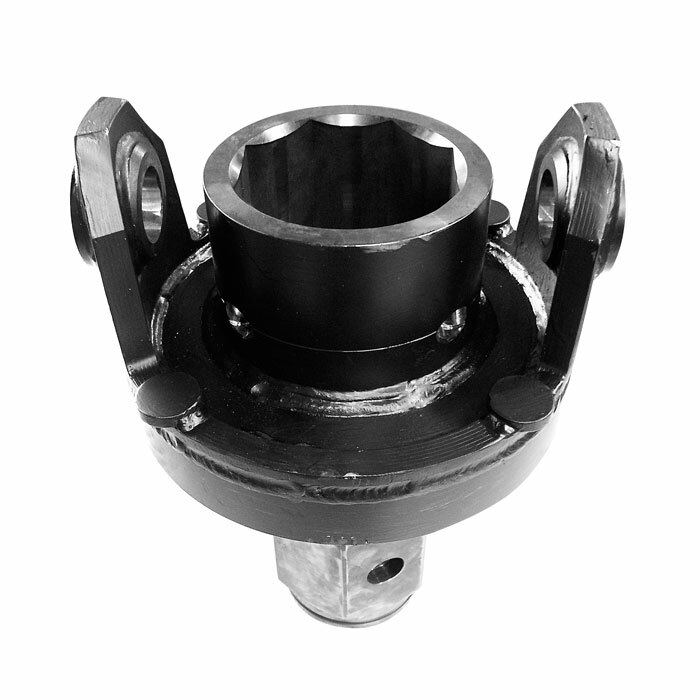 The concrete swivels are specially designed for use with rotary drives without hollow shafts. 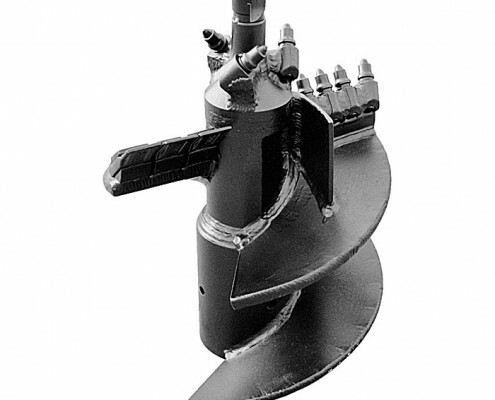 These injection heads are ideal both for occasional flushing holes (using air and/or water) and also for concrete injection with continuous flight augers, in situations where it is not cost-effective to use a hollow stem rotary head. 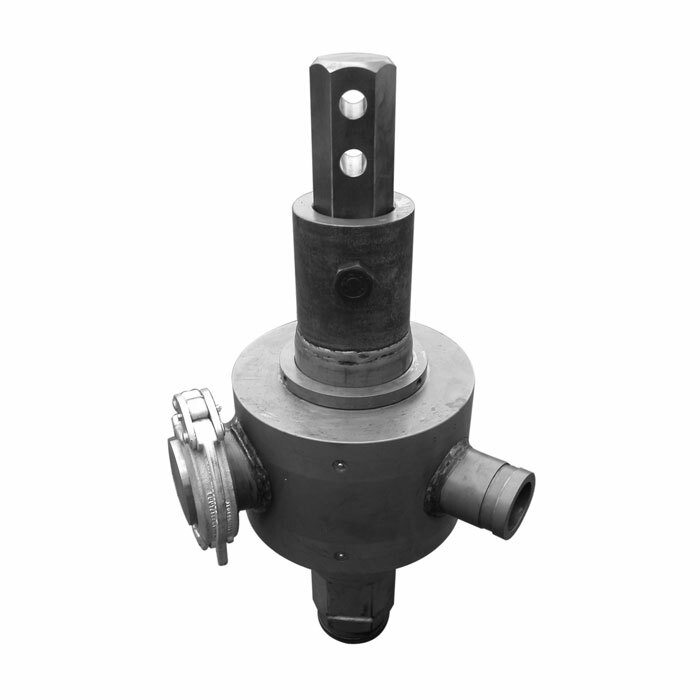 The injection head is designed for working pressures of up to 25bar, and is thus also suitable for use with modern high-pressure down-the-hole hammers. High quality packing / seal sets permit long service life, and a generously sized shaft allows high flushing rates and large flushing volumes. An inspection opening with quick-release fasteners simplifies handling and cleaning. 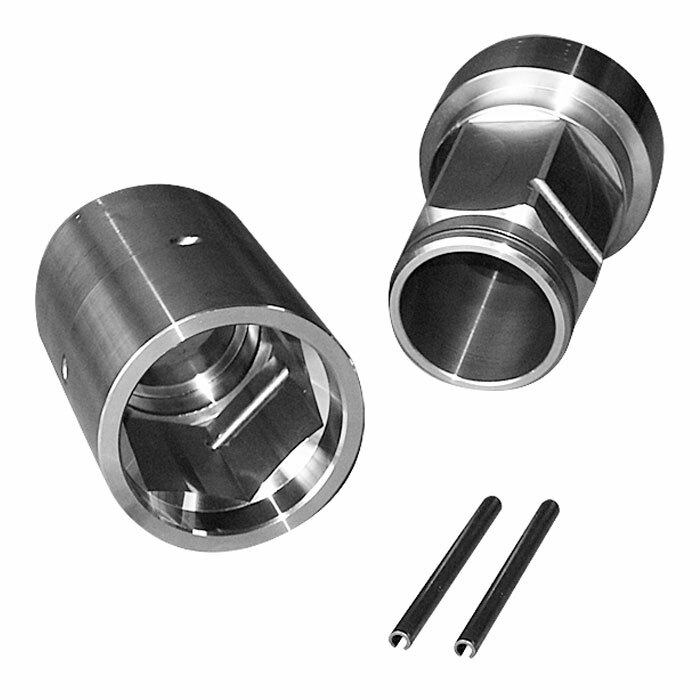 The injection head is available with hexagonal, octagonal and threaded or flanged connectors, and all components can easily be varied to suit customer requirements. The concrete hose / pipe connection is available for all popular concrete pumps (Putzmeister etc.). An anti-twist protector for flushing or injecting is included in the supply. Our continuous flight augers for casting CFA piles are used to form in-situ concrete piles both in m non-cohesive and in cohesive soils. Our range is designed to accommodate all torques and adaptors are available to connect to all makes and sized of rotary heads and drives. 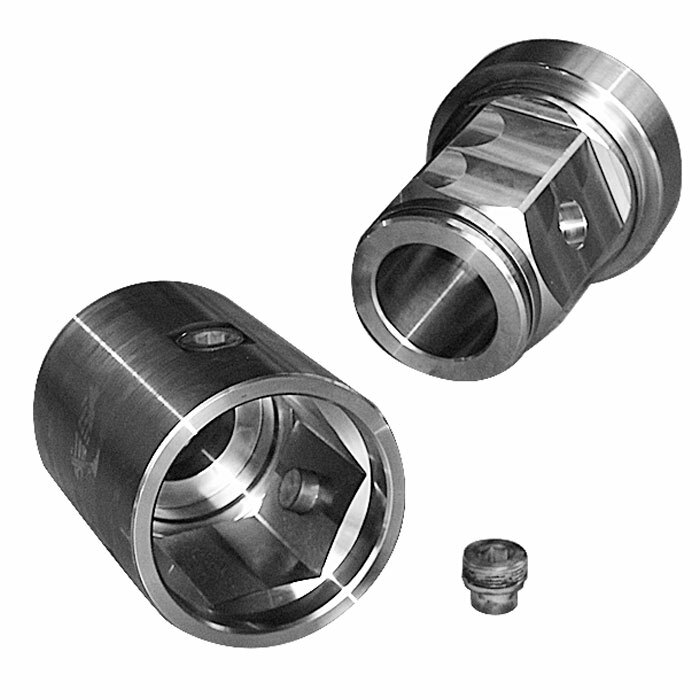 All CFA auger couplings use hexagonal connectors manufactured using EN19 grade steel for both the male and female sections. They combine the ability to cater for high torque with high resistance to wear. Hexagonal connectors up to 120mm A/F are secured with roll pins pins; for hex couplings of 150 mm and above special secured bolts are used, in order to facilitate the high retraction forces. The nominal diameter of the concrete injection bore is 75-125mm, depending on the size of connection. The flight pitch edge is reinforced against wear over the entire working length and width. 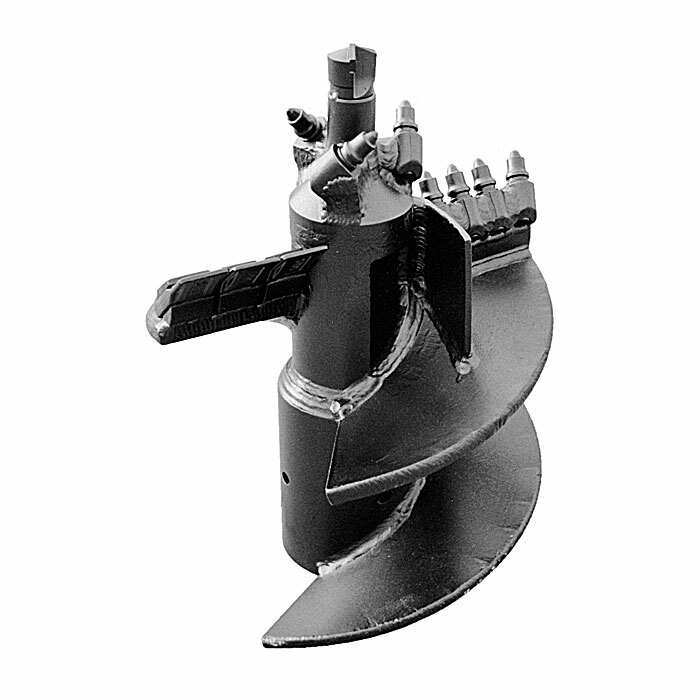 Concrete injection augers for micro and mine piling drilling systems are also available in smaller diameters, and with threaded connectors as required. We manufacture 6-sided and 8-sided connectors in all sizes in-house and are able to respond to any technical request without charging a premium. 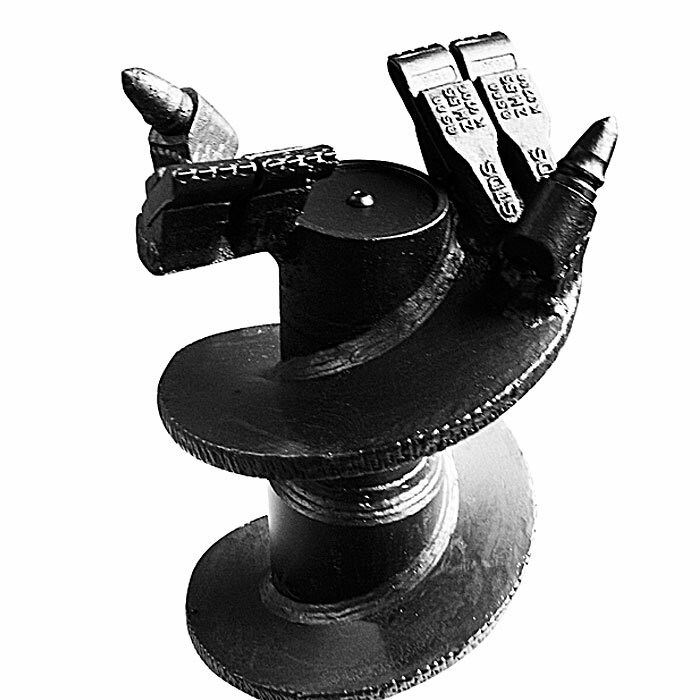 Starter / lead augers with type ISC-BKF drill bits are equipped with type BFZ100 flat teeth and type B47K bullet-attack pilot drills, or fish-tail bits. 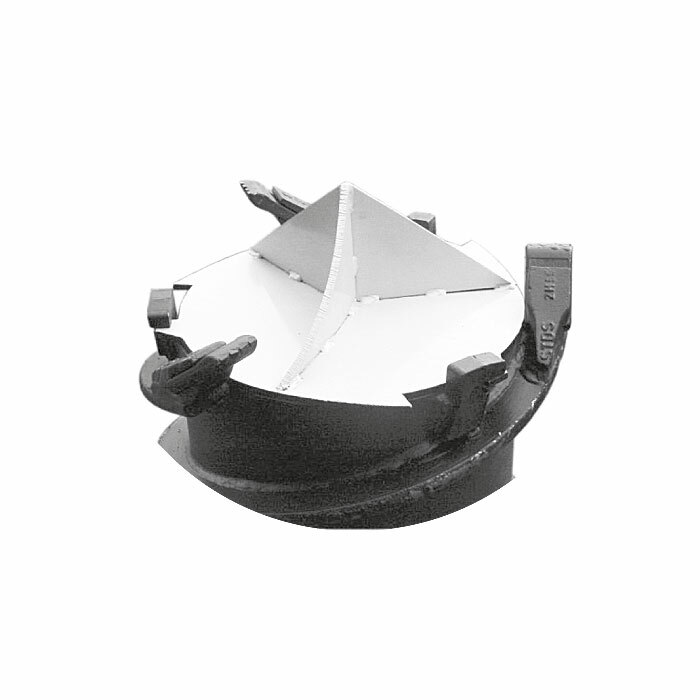 The concrete injection port is located in the lee of the cutter, to prevent entry of spoil into the hollow stem. Drill diameters of 500 mm and above (2-cutter) an additional concrete injection port is provided near the centre. All ports can be closed off if required with a low-cost “lost cap” or “auger bung”. The combination of flat toothed and point-attack teeth makes this tool from our ISC range particularly suitable for drilling in limestone and chalk, dry marl and clay, and similar cohesive or fine-particle soils. The standard working length is 1,000 mm. Starter augers with type ISC-FBKR drill bits are equipped with type B47K point-attack (bullet) teeth and tooth holders of high-wear-resistant HARDOX400, additional bullet teeth to ream the external diameter are provided, and a type B47K point-attack pilot is used. This design also has a centrally located concrete injection slot, that is closed off if necessary with a low-cost “lost cap or auger bung”, to prevent penetration of spoil into the casing pipe. The flight edges of these ISC drilling systems are provided with a tungsten carbide wear strip, and reinforcement in Hardox400 is available as an option. 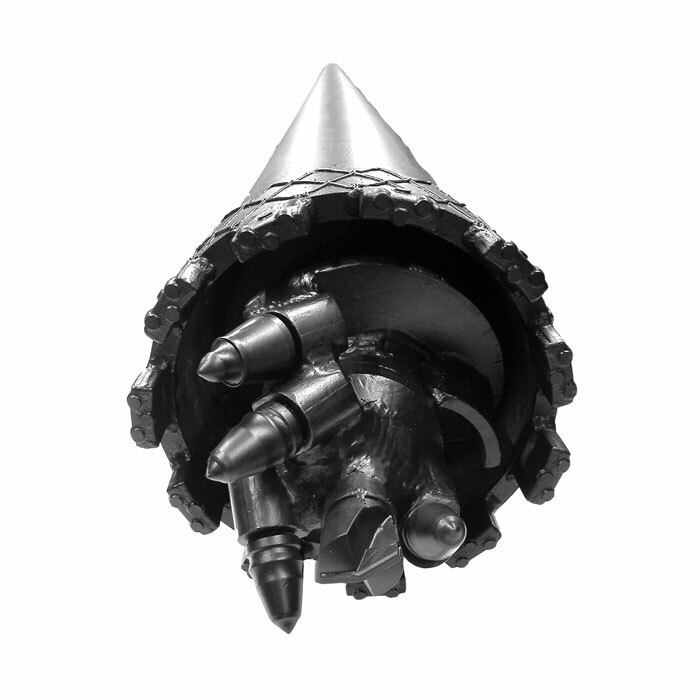 ISC-FBKR drill bits are specially designed for drilling in rocky ground and penetrating multiple layers of medium-hard rock. The standard working length is 1,000 mm. Our partial displacement augers are used to make partial displacement drilled piles in cohesive and non-cohesive loose soil. The base pipe section of the partial displacement auger is closed off by a footplate – with or without pilot. During drilling, the soil is mostly pushed aside and compacted with little being brought to the surface. When the required depth is reached, reinforcing cages are inserted within the centre stem of the auger for the whole length of the pile, the auger stem is filled with concrete, and the auger can be withdrawn. Pumping of concrete continues during the withdrawal process, to fill up the anulas between the auger stem and the borehole wall. The footplate is then decoupled by counter-turning the auger, and remains in the ground. We will be happy to offer non-standard designs on demand. 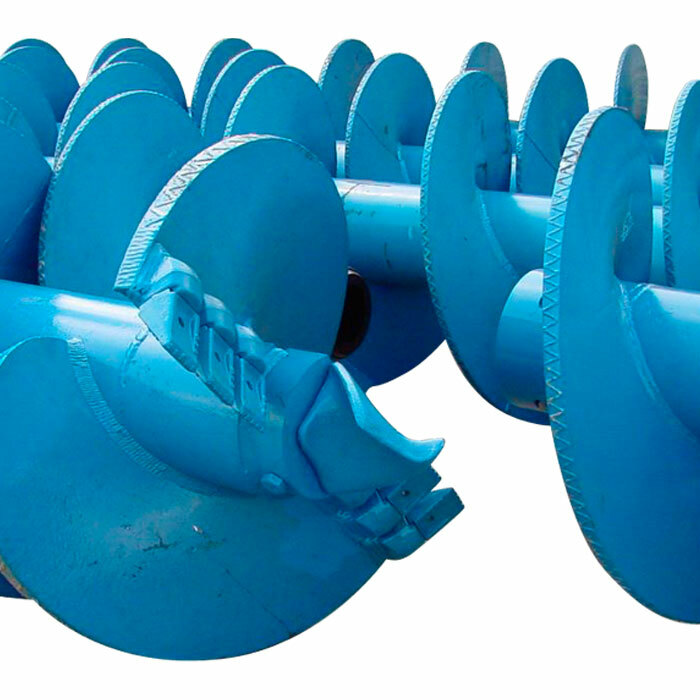 Starters for our displacement augers are designed with twin cutters (or triple cutters above a bore diameter of 400 mm), and fitted with flat teeth. The connectors are secured with heavy duty internal square-head bolts, to cope with high withdrawal forces. 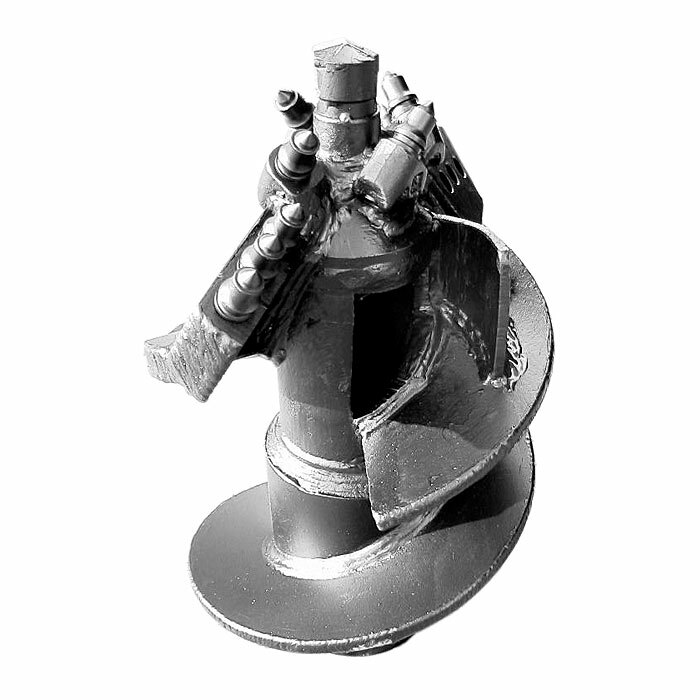 The drill bit is closed off below by a footplate – with or without pilot – which is disconnected by counter-turning and remains in the ground. Full displacement augers are used to make fully displaced cast-in-situ piles in non-cohesive displaceable loose soil. 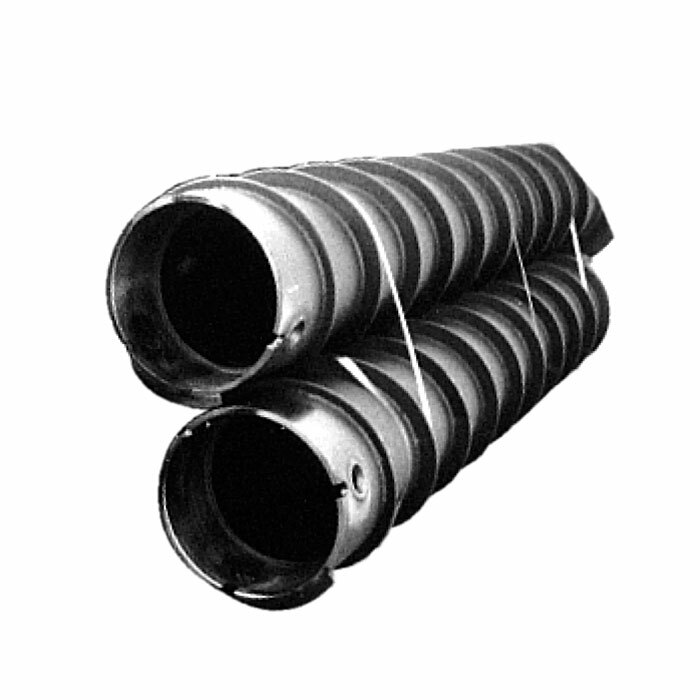 They consist of a full displacement auger that can be extended to any desired length by using an extension poles. The base of the auger is closed off using a footplate, as for the partial displacement auger and during drilling, all of the soil is pushed aside and compacted. When the required depth is reached, reinforcing cages are inserted down the whole length of the pile, the footplate is then decoupled by counter-turning the auger, and remains in the ground the auger bore and extension tubes are filled with concrete before the auger can be withdrawn. Here again, pumping of concrete continues during the withdrawal process, to fill up the annulus left and the extension poles borehole wall by the displacement head. Full displacement augers are available in all diameters and working lengths, and can be manufactured to suit individual customer requirements.